Archaeologists have discovered sophisticated prehistoric stone walls deep beneath the surface of Lake Huron that give the clearest portrait yet of the mysterious people who lived in the Great Lakes region at the end of the Ice Age. "It's just way more complex than anything we've seen before," said John O'Shea, a University of Michigan archeologist who published his findings Monday in the Proceedings of the National Academy of Science. Since 2008, O'Shea and his colleagues have been investigating an underwater ridge in Lake Huron that runs roughly between Alpena, Mich., and Point Clark, Ont. As the glaciers were beating their final retreat about 9,000 years ago, water in the lake was about 100 metres below today's level and the Alpena-Amberley Ridge was exposed. That ridge formed a narrow corridor between what is now northern Michigan and southern Ontario. Its subarctic environment of tamarack, spruce and wetland made it a perfect migration route for vast herds of caribou that roamed the area. "They were massive," said O'Shea, who suggests those herds were at least equal to the tens and hundreds of thousands of animals that make up modern caribou herds in the Canadian Arctic. "I'm imagining seas of animals going through there." The paleo-Indians who were moving onto land the glaciers were slowly exposing made good use of the animals. 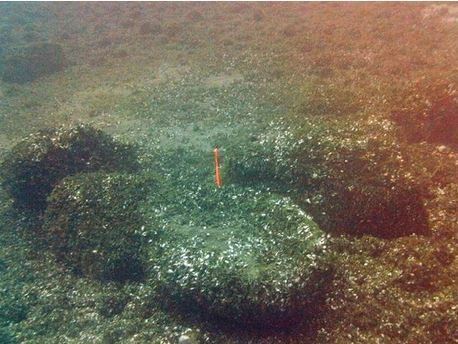 O'Shea has found more than 60 stone constructions under the water that are likely to have been used as hunting blinds. But his most recent discovery is far and beyond his other finds. "We found it a little bit by accident," he said. "We were doing this scanning sonar work to try to map these other features and this stuff appears in real time on your computer screen as you're mapping and suddenly it's like, 'Oh my God. What is this?'" In 37 metres of water, just over 50 kilometres from shore, O'Shea was looking at two stone lines forming a lane about 30 metres long and eight metres wide which ended in a corral-type structure. It had hunting blinds built into the sides as well as other lanes and structures. It is very similar to structures seen on Baffin Island that were used by hunters to channel caribou along in their natural direction of migration until they were driven into an enclosure for killing. "(It) was a much more complex, much more organized, multi-part hunting structure," O'Shea said. "It was just unmistakable what you're looking at." O'Shea also found a series of V-shaped hunting blinds which could be used by individuals or small groups. He even found flakes of flint from ancient toolmakers. The V-shaped blinds could have been used at any time. But it would have taken more hunters to effectively use the lane. O'Shea suggests that because the lane lines up with the direction of spring migration, that's when small bands of people gathered for a large, communal hunt and to do the other things humans do. "What I think it suggests is that these mobile hunters tried to create times when the population could aggregate," he said. "You need this for sharing of information, for mates, for everything else. When you get a seasonally abundant resource, the people will try to use this as an opportunity when you can get more people into one place than you can usually do." It's a revealing hint at the lives of the first people who lived there, in the shadow of retreating glaciers and long before modern aboriginals. "They were probably related to the first people to inhabit the New World," said O'Shea. "These are probably the descendants of the first folks who came in there and were hunting mastodons." A picture is beginning to emerge of a hunting and gathering people who brought down caribou in small groups in the fall, dug in snug and lived off food caches and animals such as beaver in the winter. They then gathered for a big caribou hunt in the spring. O'Shea believes many more such sites are preserved underwater, untouched thousands of years after they were submerged by rising lake levels from melting glaciers. "None of it would have survived if it had been on land. This is the only place you could find this evidence. It's hard to find, but there's no other place you could find it."